Beantown Swing Orchestra represents the future of big band swing music. Specializing in the performance of Swing Era classics as well as songs custom arranged for big band, its mission is to bring big band music back into the mainstream for current and future generations to enjoy. In 2017 in its eleventh year, the Beantown Swing pursues the goal of engaging, entertaining, and educating audiences with this historically significant and sophisticated form of American music. 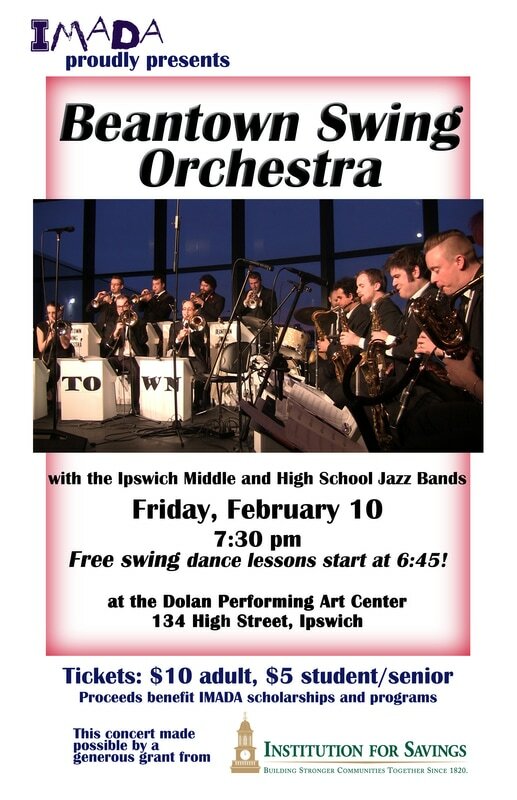 Jazz was alive and kicking up its heels in Ipswich when the whole town was invited to participate in an evening of big band swing music and dance at the Dolan Performing Arts Center. IMADA arranged with Beantown Swing, the premier swing orchestra on the north shore, to spend a day giving jazz master classes at the high school, followed by a joint concert in the evening with the IMS and IHS Jazz Ensembles. In addition to the music, professional swing dance instructors were available to teach anyone from beginners on up as the orchestra pit was turned into a dance floor for the evening while the band played on the stage above. Thanks to a generous grant from Institution for Savings, all proceeds from the concert went towards IMADA's efforts to support the arts in our schools. IMADA is grateful to Institution for Savings for sponsoring this event! Project Trio is a passionate, high energy chamber music ensemble comprised of three virtuosic composers/ performers from Brooklyn, NY. In both 2011 and 2015, IMADA was able to fund Project Trio's visits. These artists taught master classes benefiting the students at the Ipswich Middle and High Schools. Each visit to Ipswich included a day of workshops, in-school concerts, and evening community concerts in September, 2011 and January 2015. Thank you to our sponsors: Institution for Savings, EBSCO Publishing, and Ipswich Inn. In April 2010, IMADA brought the Berklee School of Music's Big Band to IHS for an afternoon of clinics and performance. Thanks to funding from the North Shore Jazz Project, Ipswich High School jazz musicians were treated to a clinic on March 18, 2011. That evening Roomful performed a rousing concert to benefit the high school's April 2011 concert tour in the United Kingdom, with our jazz students performing in two of the numbers. IMADA was pleased to bring this award winning A Cappella group to our school in 2011. They performed two concerts for Middle & High School students on Friday, March 4th. A rousing time was had by all! 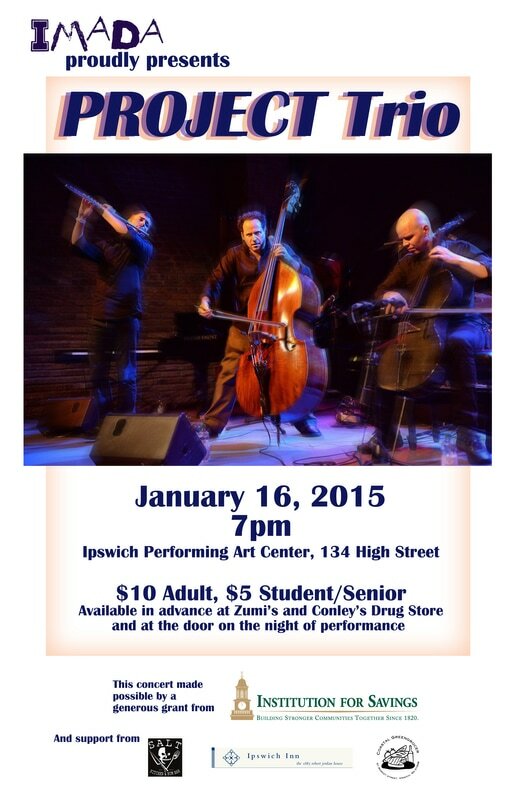 Known for their improvisational mix of classical, hip hop and jazz styles, IMADA brought PROJECT Trio to Ipswich for day-long master classes, in-school concert, and free evening concert at the Ipswich Performing Arts Center. Learn More about Project Trio.